Someday, I swear, I’m going to go all Leaves of Grass on this site. The first time I said this to Danny, a few months ago, he looked at me with confusion in his eyes. He’s used to my strange pronouncements by now. However, he doesn’t know Walt Whitman’s poems the way I do. The summer I turned 30, I exulted on the streets of New York City, my head exploding with poems. I lived in New York for the summer, thanks to a National Endowment for the Humanities grant to study the poems of Emily Dickinson and Walt Whitman at Columbia. My life has never been the same. I’ve always leaned toward Whitman, given his exuberance and joy for life, his delight in sensual pleasures and celebration of his rough edges, his resounding yes and his unflinching details. “Do I contradict myself? Very well, I contradict myself. I am large. I contain multitudes.” I think of that line nearly every day. Someday, I’ll teach it to my kids to let them know that nothing in life is that simple. I adore Emily Dickinson but I never had her restraint. Me? I’m a Whitman girl. So I know that Walt Whitman published six editions (or maybe nine, if you include the smaller revisions) of the same book. Leaves of Grass is the only book of poems he ever wrote. The first edition of Leaves of Grass, published in 1855, contained 12 poems. The last, published in 1892, contained 400 poems. And in those intervening years, Whitman returned to his earlier poems and changed them, tightened lines, and added nuance. His early work became something even more alive for all that he had lived, which changed the cadence of those poems he once wrote, then found not good enough for his later self. When I began writing this site 10 years ago this month, cooking was thrilling and new, an activity that became almost holy because it could lead me to health. Every single dish I made was created in someone else’s mind, coming to me through a recipe. I loved the recipe. I revered the recipe. I followed recipes to the letter. The first few months of this site, I wrote down other people’s recipes here. Then, I started adapting them a bit. Then, tentatively, I began playing, a bit. I remember how excited — and a little scared — I felt to make up a dish based on flavors that seemed like friends. It tasted good! I think I’ll do it again! I kept writing and writing. Writing recipes was an entirely new endeavor to me. It felt like a fling, an interruptor to all the essays pulsing out of me. I can’t look at the recipes from the first year or two of this site, especially the ones I thought were more literary for writing them in narrative form. (Apparently, I thought it was somehow daring to write ONE in a recipe list instead of using numbers.) It took me awhile to realize I had fallen in love with the contained joy of writing a recipe well. For the past week, I’ve been reading my new favorite cookbook devotedly, like a book of poems that needs reading, then reading again. 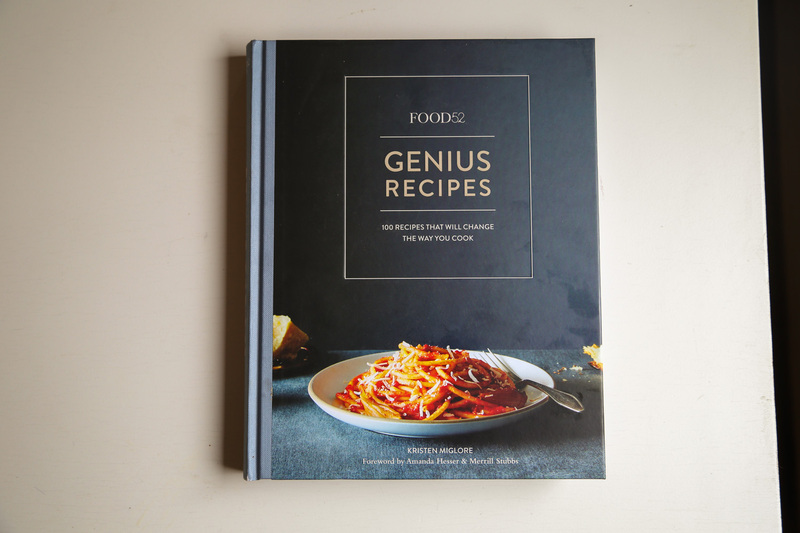 Food52 Genius Recipes: 100 Recipes That Will Change the Way You Cook , written by the darling and brilliant Kristen Miglore, is bound to stay in our kitchen. It’s filled with the most interesting and best-tested recipes by some of the finest food minds in this culture. Kristen has been writing a column at Food52 (one of our favorite food sites in the world) about genius recipes. 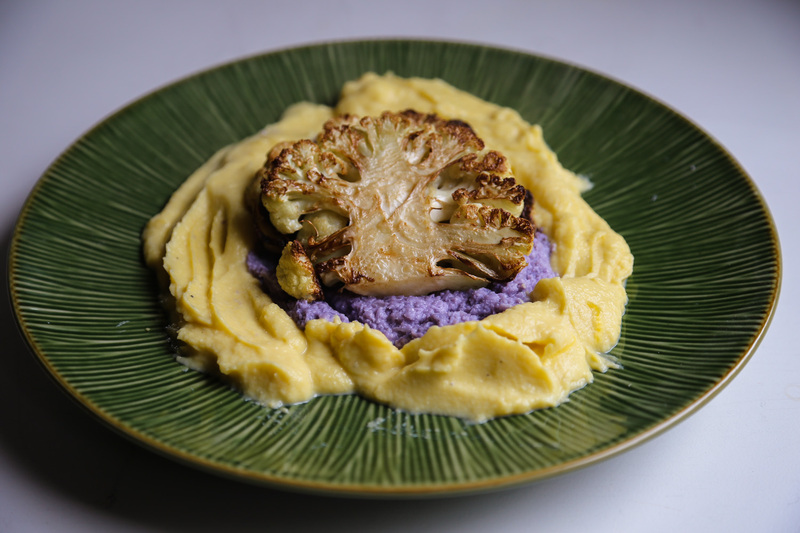 As she writes, “Genius recipes surprise us and make us rethink the way we cook. They might involve an unexpectedly simple technique, debunk a kitchen myth, or apply a familiar ingredient in a new way. They’re handed down by luminaries of the food world and become their legacies.” Reading these recipes, and then making some of them this week — that’s what you see in these photographs, our renditions of a few of the recipes in the book — has made me think about recipes even more deeply. At first, most people who write recipes online stumble into it. I did. Most of the time, it seems, people are publishing recipes that they made once, in their homes, for dinner. Nothing wrong with that. But it’s not a tested recipe. It’s about the writer, not the reader. Look at me! I created something! Recipes require me to be a bit more Dickinson than Whitman. I’m learning her restraint, a little at a time. As with any art form, write recipes long enough and you realize you want to strip away everything unnecessary, anything to do with ego. You want to make something again and again, looking more closely every time at what is essential. You want the recipe to be a distillation of an alive complicated process into clear words on the page. A recipe, in its best sense, should be a finger pointing toward the kitchen, instead of an indication of how good the author is. I’ve been writing recipes for 10 years now, and I feel as though I’m just starting to hit my stride. Have you read that incredible Ira Glass quote about the gap between good taste and honed skill? “It is only by going through a volume of work that you will close that gap, and your work will be as good as your ambitions….It gonna take awhile. It’s normal to take awhile. You’ve just gotta fight your way through.” It’s true. It’s so true. Now, after ten years of doing this, I feel like I’m finally starting to write recipes. But what do you do when you feel you’re on the cusp of work you love and then you look back at what came before? Do you leave it all, laughing, and think of it as archives? Or do you go all Walt Whitman on it and start erasing your tracks, making all the old work better, bringing it up to your standards? Life in America is different than it was for Walt Whitman. Then, he could publish another edition of poems and hope that most of the old ones had been thrown away or torn up. But we live on the internet now, where readers find recipes from 2007 by googling the name of the baked good they want to make, and thinking you wrote it yesterday. My way is clear. Over the next few months, slowly and with great purpose, I’m going to go all Leaves of Grass on this place. 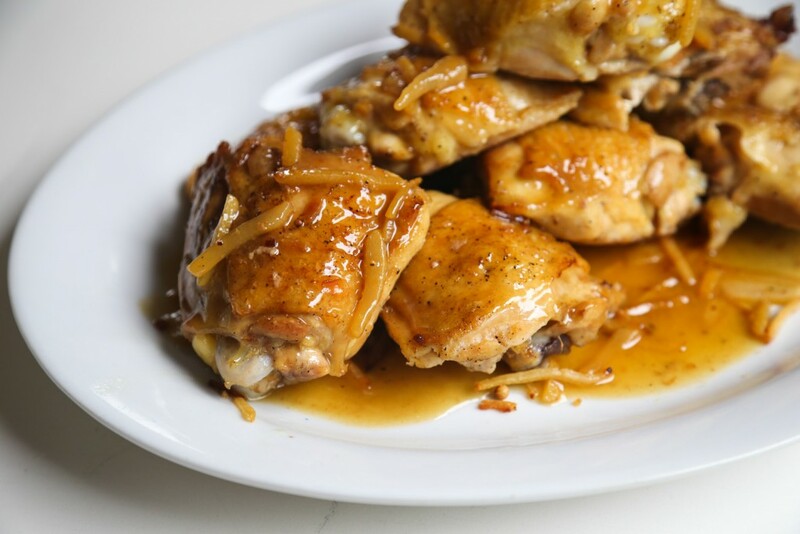 This dish is from Julia Child, the ultimate genius recipe developer. She worked tirelessly to make recipes as close to perfection as she could. That work was driven by a desire to truly understand food. (She didn’t start down her professional food path until she was in her 40s, a fact I think of often.) Her curious mind and joyful yet meticulous attitude toward her work have provided millions with great meals. 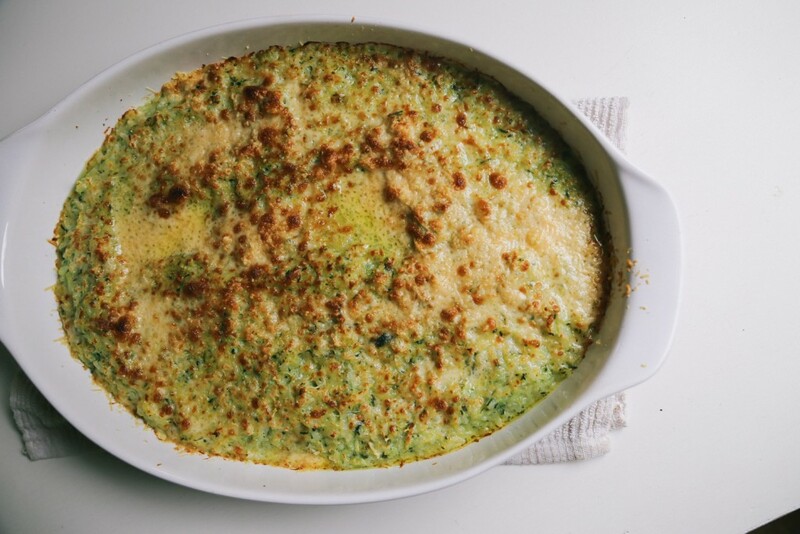 The genius part of this zucchini gratin is grating and salting the zucchini to pull out the vegetal liquid. That liquid, with a touch of milk, makes an oh-so-light béchamel. This plus the addition of a bit of cooked rice means a gratin that holds together without being weighted down by a ton of cream and cheese. This truly tastes like zucchini, like spring, like just the thing you want to eat right now. Salt and drain the zucchini. Cut off the ends of the zucchinis. Give them a gentle scrub to take off any dirt (if they’re from the garden) or wax (if they’re from the store). Grate the zucchini on a box grater, or in the food processor with the grating disc. Put the grated zucchini into a colander set over a large bowl. Toss the grated zucchini with the kosher salt, taking the time to mix in the salt well. Let the zucchini drain into the bowl for at least 5 minutes. Grab a handful of the grated zucchini and put it in a kitchen towel. Put the towel over the bowl of zucchini water, close the towel around the ball of zucchini and squeeze out the water. Squeeze again and again until you have drained the zucchini of as much water as possible. You’ll never get the zucchini entirely dry but it shouldn’t be dripping with water anymore. Continue with the remaining zucchini. Cook the rice. Set a small pot of water over high heat. Bring the water to a boil. Add the rice to the boiling water. Let the rice boil vigorously for 5 minutes, then drain it from the water and set aside. Prepare to bake. Heat the oven to 425°. Generously butter the bottom and sides of a baking dish about 1 ½ inches deep that will hold 6 to 8 cups of food. Set aside. Cook the vegetables. Set a large skillet over medium-high heat. Pour in 4 tablespoons of the oil. When the oil is hot, add the onion and cook, stirring frequently, until the onion is soft and translucent, about 7 minutes. Turn up the heat to high and stir vigorously while the onions brown just a bit more. Stir in the grated zucchini and chopped garlic. Cook, turning the zucchini frequently, until the zucchini is tender, about 5 minutes. Turn the heat down to medium and sprinkle the flour over the top of the vegetables. Stir for 2 minutes, making sure everything is evenly coated with the flour, then turn off the heat. Make the gratin. While the zucchini is cooking, set another small pot on medium heat. Pour the zucchini water into a large measuring cup. Add enough milk to make 2 cups of liquid. Heat the liquid to a slow simmer without letting it boil. Slowly, pour the heated zucchini liquid into the skillet of vegetables. Turn the heat to medium-high again and stir gently. When the vegetables and liquid clearly begin to simmer, turn off the heat again. Stir in the cooked rice and most of the Parmesan. (Save about 3 tablespoons for the top.) Taste the zucchin and season with salt and pepper to taste. Pour the vegetables and liquid into the buttered pan. Toss the remaining cheese on top and drizzle it all with the remaining olive oil. Bake the gratin. Bake the gratin until the top is bubbly brown and the reduced liquids are simmering on the edges, about 30 minutes. Serve immediately. Feel like playing? The cheese is pretty important here as a binder, so I’m not sure how to make this dairy-free. However, if you are lactose intolerant, you could use lactose-free milk here, or a neutral-tasting dairy-free milk in the place of the traditional cow’s milk. I’m guessing this would be great with another summer squash as well. And, try a stronger-tasting cheese such as Pecorino or feta here for a different taste. wow… That is a serious amount of work you’re gonna be doing. And ten years is a huge amount of time. But you’re right: people still use some of my older recipes from 8 years ago when I first started and that are not what they should be. I’ve gone back and adapted recipes here and there where I ran into obvious issues with some. I’m not a recipe writer, that’s for sure! And I’m so gonna get the food52 book. Looks brilliant! This is a good piece of writing right here, I enjoyed reading this. Your expertise in creating successful GF recipes has become noticible. Several times I have looked at earlier recipes and wondered what you would do to revise them with your deeper understanding of flours, gums and healthy. GF cookbooks spill off the shelf at the local bookstore but I return to yours and your website to find just the right way to prepare a dish. Once again I find myself inspired and impressed. Thank you. Under the “Make the Gratin” portion of the recipe it seems something may be missing regarding milk. You mention putting the zucchini water into a large measuring cup but are we adding milk to make two cups or are we adding zucchini water to an unspecified amount of milk to make two cups? I am confused by this as well. I wouldn’t expect to get much liquid from the zucchini, so are we really supposed to add possibly a cup or more of milk? That doesn’t sound like a “touch”. I’ve been waiting to comment because I thought you might address this question, but it’s been four days now…any chance of a clarification? After the first comment I changed the sentence to make it more clear. You actually get that much liquid from the zucchini! When we made this one, we got 1 1/2 cups of zucchinni water, so we added 1/2 cup of milk. It depends on the zucchini you buy. I love that you love Uncle Walt. I find a kindred spirit in anyone that returns to his works and finds importance & meaning in them. And what an undertaking – I hope you enjoy the process of revisiting and revising, it sounds daunting but rewarding, and your readers will surely benefit from the 10 years of knowledge you’ve gleaned. All the best! I thoroughly enjoyed reading this as I do all your posts. Thank you. You’ve inspired me to not only try another of your recipes, but to take out my copy of Leaves of Grass and read though it again; it’s been a long time. I can’t wait to try the zucchini gratin recipe, but I’m curious about that pic at the top of your post….that too looks delicious! Is it one of your recipes and if so, can I (we) get the recipe for that too? I’ll look through my copy of Gluten Free Girl Every Day to see if it’s in there, I don’t recognize it. Shauna, I am a writer but aspire to the clarity, joy and inspiration your writing provides. I applaud your going Walt Whitman on us! I await the cooking adventures ahead with your revised treasure maps. Thank you for all you do! Your writing sounds much happier this spring. Thank you for sharing not only recipes, but how you find solutions. Those inspirations help me solve my own baking puzzles too.